Earlier this year, I reached into a friend’s beer fridge to grab something light and refreshing before heading outdoors for a hike (as far as I understand the rules, writing this column gives me free access to everyone’s beer). That afternoon’s chatter distracted me, however, because I made it two or three swings into my bottle before I felt what was hitting me. I glanced down to find I was sampling a beer called Olde School by Dogfish Head, which clocks in at 15-percent ABV (alcohol by volume). That’s stronger than most wines, and nearly four times the strength of the beer for which I’d been reaching. If I’d kept on sipping, fellow hikers would have found me on the road not taken, napping in my car in the parking lot. That bottle of Olde School is classified as a “barleywine,” a style of strong, full-bodied beer that ages well and is often aggressively hopped. But more generally, ales in the eight to 15-percent ABV range are typically marketed as “imperials,” which describes styles of beer (including stouts, pale ales, and pilsners) brewed with big, bold flavors, and a potent punch. Historically, the term categorized big-malted, strongly-hopped English beers designed to be shipped overseas to the Russian imperial court. In a similar manner, plentiful loads of hops preserved English beers bound by ship for India, hence the India Pale Ale style. Many American imperial beers, in other words, share a flavor profile similar to double IPAs and triple IPAs. 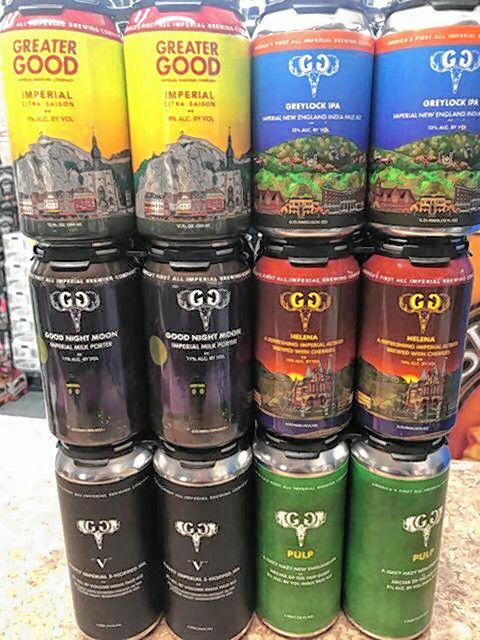 Many American breweries offer at least one imperial beer, but it seems that our local Greater Good Imperial Brewing Company, which debuted last August, is America’s first all-imperial brewing company. The brewery, which quickly grew out of its first facility in Connecticut, has been brewing 15-barrel batches at Brewmasters in Williamsburg, and the company plans to open a full-scale brewery and taproom in Worcester in 2018. “The worst thing you can hear about a strong beer is that it’s boozy, with an alcohol burn,” he added. How balanced and drinkable are the beers from Greater Good? I tried several to find out. Radziuk’s attention to the needs of a well-balanced strong beer really pay off. Greater Good’s imperial milk porter, called Good Night Moon, is potent enough, at 11-percent ABV, to tip any nocturnal craft beer sipper toward sleepytime. But it has a nice, dark malt profile, with just a little bit of hoppy bitterness at the end. Greater Good’s imperial saison, called Citra, wasn’t my favorite. Flavors built on Belgian-style yeasts seem especially tough to “round out” at a high ABV, and I felt Citra, at nine-percent, lacked the yeasty fullness of a really great, flavorful Belgian. I liked the Greylock IPA much more. At 12-percent, it’s really balanced, with a cloudy and aromatic heft that tastes smooth, creamy, and hoppy all at once. Helena, a ten-percent German-style altbier brewed with cherries, is terrific, as are the two current offerings in Greater Good’s “8 is the new 5” series: a juicy, eight-percent Vermont-style IPA called PULP, and an eight-percent, five-hopped IPA called V.
Good Night Moon, the imperial milk porter, also took the team quite a while to perfect. That beer uses lactose for mouthfeel, with a roasted barley flavor profile. “Packed around that,” Wengender explained, “are fair-trade coffee and cocoa. But at 11-percent, we were still getting a little burn.” Further tweaks to the recipe produced “roasty, chocolatey flavor right out the gate, but once that leaves your palate, up comes this subtle hop profile,” he said. Over time, Greater Good beers may appears more often on tap. But for now, about 95 percent of the brewery’s revenue comes from can sales at stores. 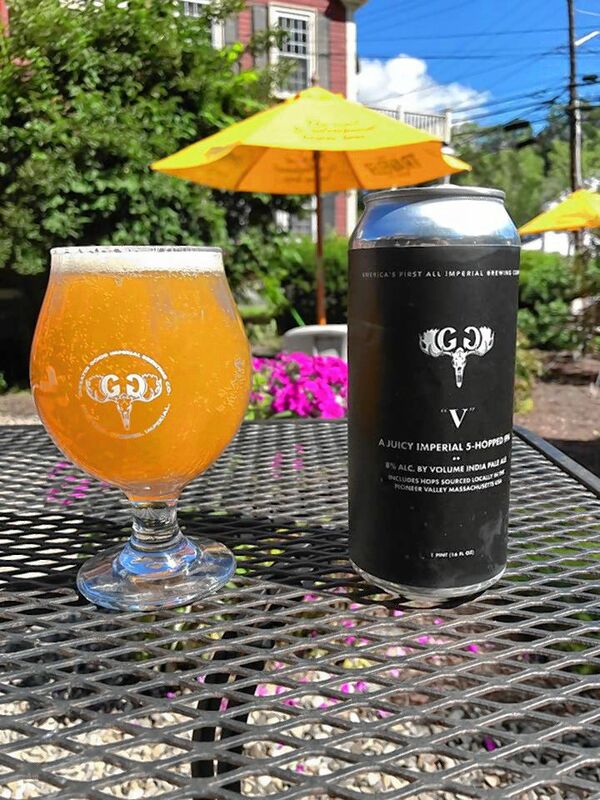 Last August, Greater Good decided to go to market first in the Chicopee and Springfield area, but at this point, the company’s beers are sold from Boston and the Berkshires. For now, these brews can only be found in Massachusetts.